Light is a powerful tool to manipulate a vast variety of chemical processes. 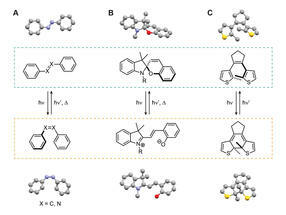 The use of specific photochromic molecules allows chemists to perform reactions in a reversible fashion with a high spatio-temporal resolution. Researchers from the Humboldt-University in Berlin have developed a novel method to regulate polymerizations with the aid of a photoswitchable catalyst system. Plastics have become fundamentally important to our way of life over the last decades and can be found in almost every industry sector, ranging from simple food packaging to high-tech spaceships. The versatile properties of polymers, such as lasting robustness, low weight, corrosion resistance and transparency, render this type of material ideal for many applications. Although polymers in their simplest form only represent small molecular building blocks (monomers) linked up to long chains, they exhibit extremely high durability, which was initially plastic’s huge benefit. However, this particular feature has become more and more problematic as petroleum-based plastics hardly degrade in nature. As a consequence, they stay in the environment for hundreds of years, and in the form of tiny particles (microplastic) they can enter the food chain with unpredictable consequences. Approximately 8.3 billion tons of plastics have been produced worldwide to date, while 79 % of the plastic waste is stored in landfills, 12 % was incinerated, and only 9 % is being recycled . As a result, polymers are ubiquitous in the environment, creating a global environmental crisis. Effective and more pronounced recycling, reducing the use of polymers and reusing polymeric products are key strategies to tackle this man-made issue . Another promising approach is the replacement of petroleum-based plastics, such as polyethylene (PE) or polypropylene (PP), with biodegradable polymers. Polylactide (PLA) is the most prominent example of a biocompatible and biodegradable plastic and has successfully been used in packaging as well as biomedical applications (e.g., as surgical sutures) . However, higher production costs compared to traditional polymers prevent polylactide to be produced in high volumes, and its poor thermal stability above 60 °C limits potential applications . Further developments in the field of polylactide and other biodegradable polymers are therefore essential to increase their scope and utility. Without doubt, novel and efficient catalytic methods are paramount to facilitate progress in this emergent area of research . Researchers from the Humboldt-University in Berlin, the German Federal Institute for Materials Research and Testing, and the Heinrich-Heine-University in Düsseldorf have now reported on a single catalytic system, whose activity can be programmed externally with different colors of light in order to regulate important properties of the formed biodegradable macromolecules in-situ (Fig. 1) . Fig. 1 Working-principle of a photoswitchable organocatalyst. The ring-open phenol activates the monomers via hydrogen-bonding and thereby facilitates chain growth of the polymer (exemplified with L-lactide). UV light transforms the catalyst into the non-active, ring-closed ketone, which can be re-activated by illumination with blue light. The use of photons has the great advantage that a polymerization process, which is performed in a closed system, can be remote-controlled from the outside without the need to open the system in order to add or remove substrates. 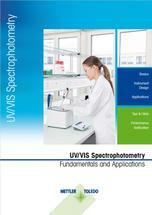 Light’s non-invasive character, its simple handling, its high temporal and spatial resolution, as well as the precise tuning of its energy are further advantages. For these reasons, a photoresponsive catalyst was developed, which can be toggled reversibly between two states with orthogonal properties. The organocatalyst consists of a typical photoswitchable diarylethene bearing on the one side a phenol group which in its open form is capable of activating cyclic monomers, such as l-lactide, via hydrogen bonding. 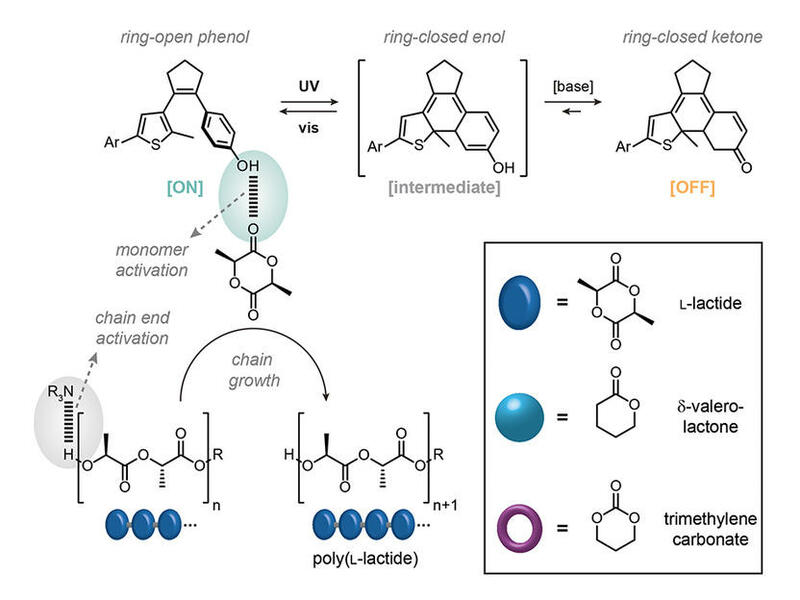 Illumination with ultraviolet (UV) light induces an electrocyclic ring-closure event to initially form the ring-closed enol isomer, which then further tautomerizes quantitatively to the thermodynamically more stable ketone form – a process that the researchers call “photoumpolung” . In this state, the hydrogen-donating ability is temporarily lost and consequently no activation of the monomer is possible. The catalyst is thus turned OFF. With visible (vis) light, this process can be reverted to regenerate the active ON state. In synergy with a tertiary amine base acting as a co-catalyst to activate the chain end of the polymer, the living ring-opening polymerization of cyclic monomers can be performed. After a successful (six step) synthesis of the photoswitchable phenol, the photochemical performance was initially analyzed. In UV/vis spectroscopy experiments the photoswitch shows an excellent behavior with (almost) quantitative reactions in both directions, i.e. ring-closure as well as ring-opening, and high robustness, even throughout several switching cycles. Subsequently, the catalytic tandem consisting of the photoswitchable phenol and an amine base was applied in two key experiments to light-regulate homopolymerizations as well as copolymerizations in a closed system. Fig. 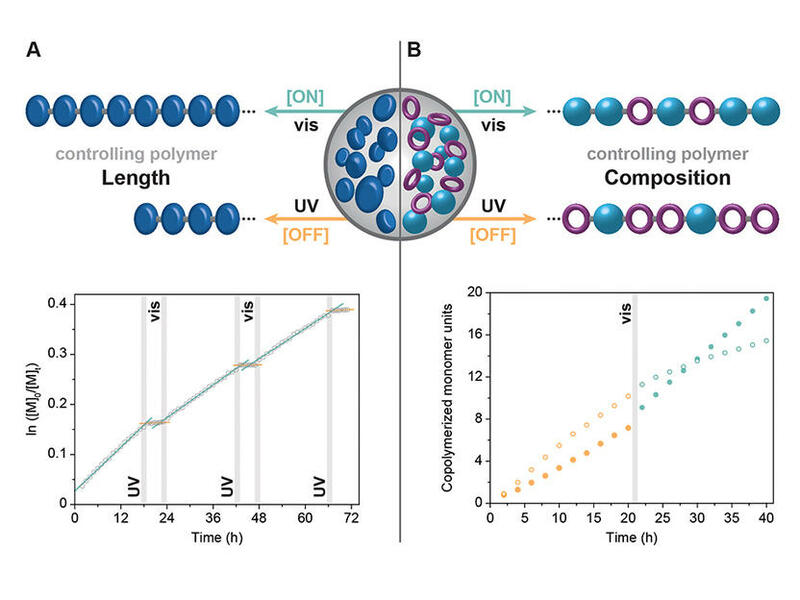 2 Controlling the polymer length of poly(L-lactide) (A) and composition of a trimethylene car-bonate/δ-valerolactone copolymer (B) with light. In the first experiment, the polymerization of l-lactide was controlled by irradiating the polymerization mixture alternatingly with UV and visible light. As a result, the polymerization could be stopped after exposure to UV light and it resumed after visible light illumination – these ON/OFF cycles could be repeated at least three times without showing a loss of activity (Fig. 2A). 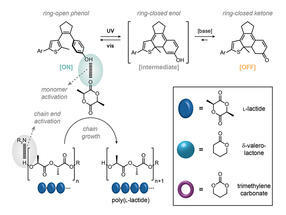 Moreover, the living character of this ring-opening polymerization as well as characteristic properties of the formed polylactide (narrow dispersity, high end-group fidelity, and predictable molecular weight) were not impaired by the illumination steps. In the second experiment, the copolymerization of a cyclic carbonate (trimethylene carbonate, TMC) and lactone (δ-valerolactone, VL) catalyzed by the dual catalytic system was manipulated in terms of the ratio of incorporated monomers within the same polymeric backbone (Fig. 2B). In preliminary experiments, it could be demonstrated that the open phenol isomer accelerates the polymerization speed of VL but not of TMC while, in both cases, the closed ketone isomer again remains inactive. Under optimized conditions, both monomers were mixed together and copolymerized, starting with the photoswitch in its inactive ketone state. After 20 hours, the ratio of incorporated monomers was on the side of the carbonate. Subsequently the mixture was irradiated with visible light to convert the diarylethene completely into active phenol. Consequently, the polymerization rate of the lactone increased significantly, which ultimately resulted in an inversion of the monomer composition with more lactone incorporated than carbonate. Chain length and molecular weight as well as monomer composition of copolymers are crucial parameters of polymers, affecting their physical as well as chemical properties immensely. For instance, in the case of biodegradable polymers their degradation behavior, which mainly proceeds via hydrolysis of the ester linkages, is an important feature that is strongly influenced by the aforementioned factors. Controlling these factors solely with the power of light demonstrates a promising tool to precisely tune and tailor the polymer’s characteristics and should stimulate further advances in the realm of biodegradable polymers. The key challenge will be to generate inherently more active photoswitchable catalysts in order to reduce reaction times on the one hand and increase the molecular weight of the formed polymers on the other hand. Moreover, the researchers envision that their fundamental results could advance more sophisticated fabrication techniques, such as 3D printing and photolithography. 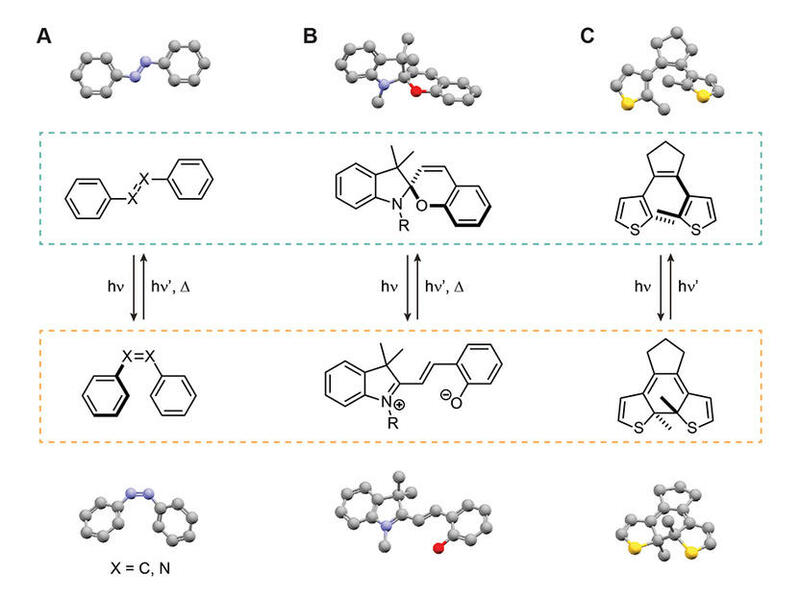 Photoswitches are organic molecules, which can exist in two distinct (meta)stable states. These isomers differ significantly in their properties, especially in their absorbance behavior, which enables the interconversion of these states by irradiation with light of different wavelengths. The graphic illustrates the switching behavior of some of the most prominent classes of photoswitches: Azobenzenes and stilbenes (A), spiropyrans/merocyanines (B), and diarylethenes (C).